Sutton Park, granted to Sutton Coldfield in 1528 by Royal Charter, was soon under threat from another provision of the same Charter. This permitted anyone wishing to establish a farm of up to sixty acres on the common lands to do so, paying a small ground rent to the Warden and Society (that is, Sutton Corporation). No doubt the intention was to make Sutton attractive to ambitious men who would help the town to prosper. The Park was deemed to be common land, and three farms of about sixty acres were soon carved out of it. These were on the south side of the park, where the original deer park boundary ran in a smooth curve to the south of what is now Monmouth Drive. These three farms, later known as Booth’s Farm, Old Park Farm and Stonehouse Farm, occupying nearly 240 acres of the original Sutton Park, eventually came into the possession of the Holte family of Aston Hall. Booths Farm was the middle one of the three, the farmhouse being near the junction of Halton Road and Darnick Road. Its land was bounded by Stonehouse Road, and extended a long way northwards across a very marshy valley. In the sixteenth century the then owner, Mr. Gibbons, dealt with this by making a causeway which gave access to the farmland to the north and acted as a dam to turn the useless valley into a productive fish pond. Sir Thomas Holte built a bigger dam in 1730, creating Powell’s Pool to drive a water mill. The Holte line came to an end with the death of Sir Charles Holte in 1817, and their Sutton estate ended up in the possession of Lord Somerville. In 1850, Lord Somerville had two sons, a brother and five nephews. A son and a nephew died in the Crimean War, the brother and another nephew were killed when their ship sank in the Mersey. The old lord died in 1864, his son had a fatal hunting accident in 1869, and the remaining nephew, whose other brothers had died of natural causes, returned from Australia to take the title. He died in 1870, leaving no male Somerville to inherit the property, known from then on as the Somerville Estate. In 1937 Sutton Corporation built a new road, Monmouth Drive, partly to create work for unemployed men. The terms of the agreement with the Somerville Estate and other owners was that land north of Monmouth Drive should revert to Sutton Park or be used for other recreational purposes. So after 400 years Powell’s Pool and the fields to the north came back into Sutton Park - you can still see the hedges which formed the northern boundary of the farmland. 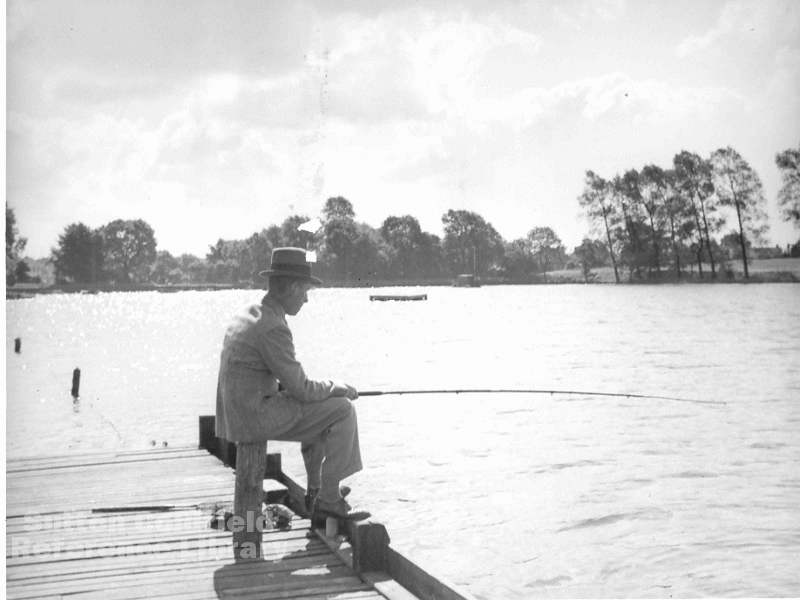 Powell’s Pool, June 1937 -photo courtesy of Sutton Reference Library.